CECH-20xxB - Model B - console in all regions. The CECH-20xxB 250gb PS3 debuted in November 2009, immediately after its 'sister' model, the 120gb CECH-20xxA. These were both the premiere models of the new 'slim' series, radically different in appearance and construction from the original 'large' consoles. The end-user experience and features were almost no different from the standards set by the CECHK “80gb” before them, with two USB 2.0 ports and no PS2 compatibility now the standard. Early tests of the CECH-20 series have indicated it consumes almost 50% less electricity than the original CECHA “60gb” in the same operations. The machine has proven to run quieter, cooler, and altogether more efficiently than previous models. 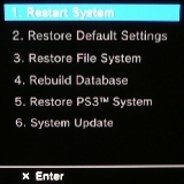 The only particularly apparent function removed from the new series was the in-XMB option to install alternate operating systems to a hard drive partition. POWER CONSUMPTION - 100 Watts Avg. / 250 Watts Max. All first-party Sony PS3 accessories work with the 'slim' models, though they no longer use the large-style AC cables of the originals.